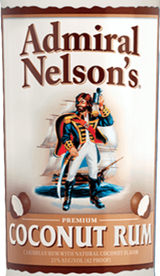 Admiral Nelson's Premium Coconut Rum is made from imported light rum and has a fresh, tropical, coconut aroma and flavor. This delicious rum can be enjoyed in many ways, over rocks or blended with fruit juice to make a tempting frozen cocktail. Anyway you prefer it's delicious.